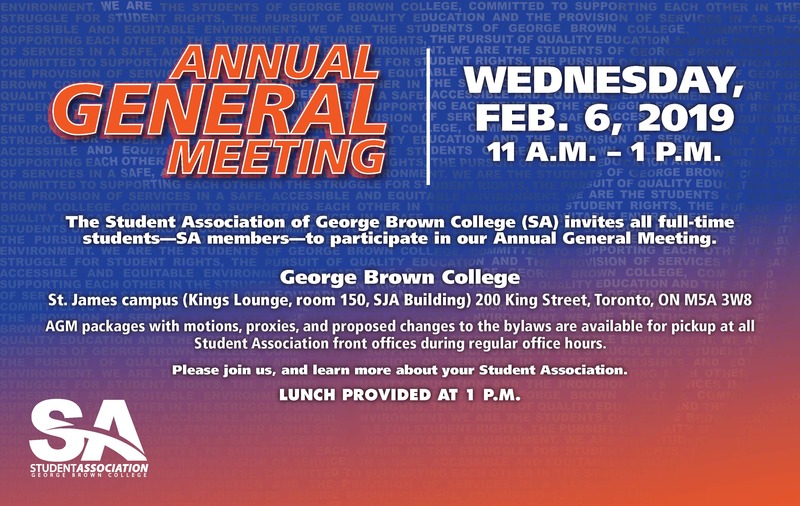 The Student Association of George Brown College (SA) invites all full-time students—SA members—to participate in our Annual General Meeting. The Annual General Meeting package with motions, proxy forms, and proposed changes to the bylaws will be available for pickup at all Student Association front offices during regular office hours starting on Friday, Jan. 25. You can also download and view the proposed changes to the SA’s constitution and bylaws at the below link. A resolution to rescind and replace the Constitution and By-Laws of the Student Association of George Brown College, 2019. If you would like to submit a motion for the meeting, please download the petition template for motion at a meeting of members and submit it by email to the director of communications and internal at dircommunicationsinternal@sagbc.ca by Friday, Dec. 28 at 5 p.m.
A motion intended for a meeting of the members from any individual member shall be placed on the agenda of a meeting of the Board if fifteen (15) members sign a petition in support of it. The full text of the motion must be included on the petition and the text of the motion and signed petitions must be submitted to the Director of Communications and Internal a minimum of ten (10) business days before the meeting of the Board. Please join us, and learn more about your Student Association.